The UPS Store serves as Fayetteville’s one stop shop for Printing, Shipping and more. For years, The UPS Store has been the source for everything from banner printing to freight shipping in the Fayetteville, NC area. When you need to get a print job done, they make it easy, with great prices and great service. 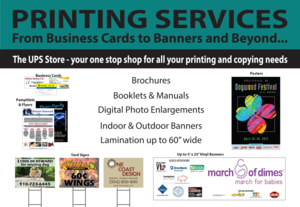 So no matter if you need to print invitations for your next event, create a custom sign for your next business, or ship something across the country, The UPS Store is here for you. The UPS Store also offers a wide array of other services, including full service mail boxes with a street address (unlike a P.O. box at the post office where you receive only U.S. Mail, you can receive products via all carriers), fax services, notary, shredding, packaging supplies, packaging services and more. To learn more about the UPS Store visit their CityView Business Directory or call them at (910) 860-1220.